Passengers are welcome to board our ship at 6:00 p.m. After comfortably settling into your cabins, we'll introduce our crew at a welcome cocktail. Tonight we'll enjoy dinner followed by a panoramic boat tour of Strasbourg. This morning will be spent cruising towards Waltenheim-sur-Zorn through the Brumath Forest. In the afternoon, join us on an excursion to hike along the hops trail in Wingersheim. With a heritage of wine-growing and beer-brewing, Alsace will give you a new perspective by showing you how hops are grown. We'll return on board before leaving for dinner to taste the tarte flambée, a local specialty, at a restaurant in Waltenheim (included). We'll set out on a guided tour of Saverne. Virtually unknown by the usual tourist routes, the city offers a wide range of places to discover. We'll return on board and cruise towards Lutzelbourg. 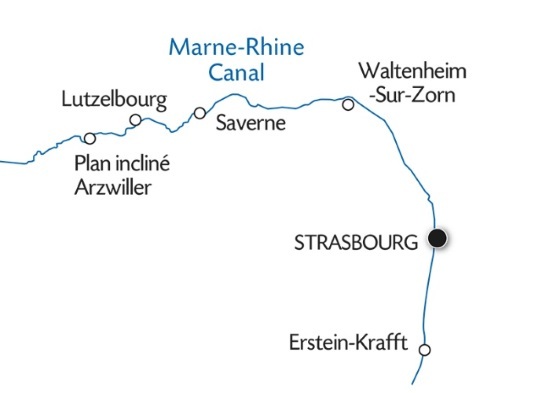 The canal winds through the Vosges Mountains before joining the Lorraine region. Late in the afternoon, we suggest you to set off on foot to marvel at Lutzelbourg Castle. We'll set off for an excursion to the Arzviller inclined plane. Along the way, we will stop at the crystal glassworks near the inclined plane. We'll learn about this time-tested tradition, and watch crystal blowing and cutting demonstrations. The boat will cruise through the Artzviller inclined plane - an incredible experience. A fabulous structure, this transverse system boat "elevator” is one-of-a-kind in Europe. The inclined plane replaces 17 successive locks over 2.5 miles that once needed a full day to navigate. The Haut-Barr Castle, the "eye of Alsace"
(1) In case the falconry show cannot take place, the excursion will be replaced by a visit to the Hôtel-Dieu.